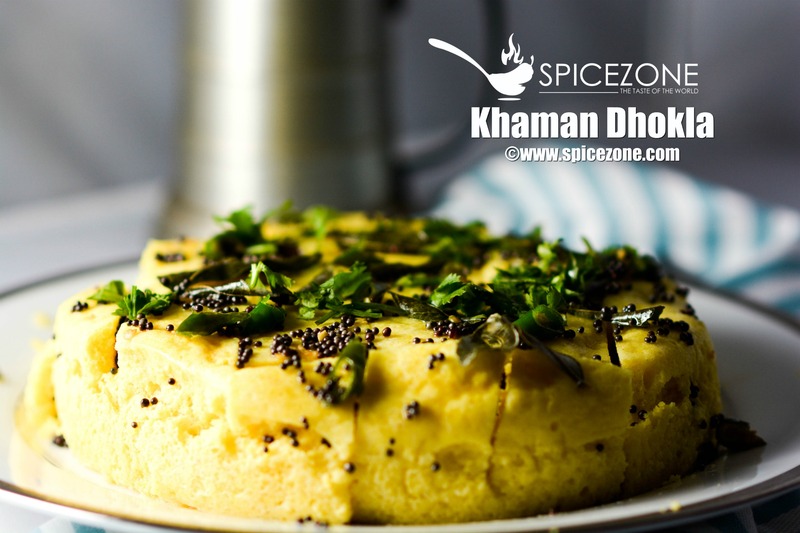 Khaman Dhokla is one of the popular traditional recipe from the state of Gujarat. It is made with chickpea flour which is also called besan. This is a healthy recipe as it is steamed which makes it low in calories and can be ready in less than 30 minutes. You can enjoy it as a breakfast or an appetizer with a cup of tea. 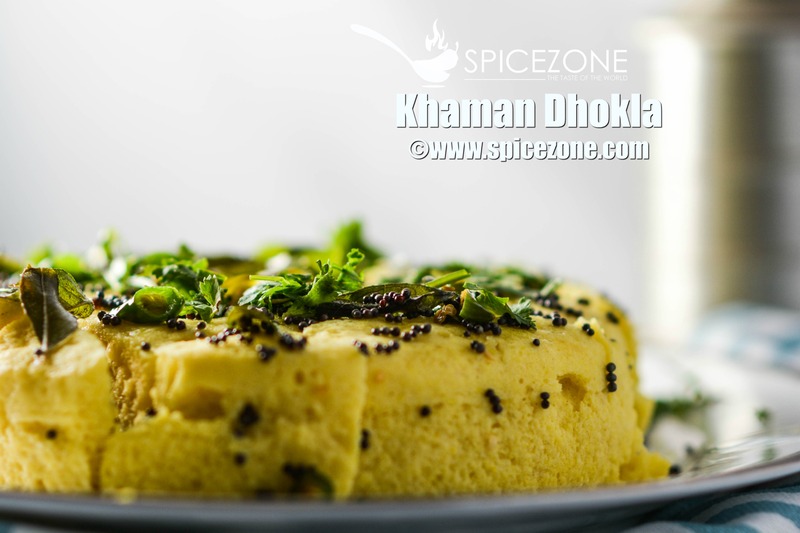 There are so many different ingredients that are used to make dhokla. You can use different grains if not making with besan. Always wanted to learn the right way of making it as it is one of my favorite dish which I can eat any day and everyday. I have never had one like this before and I can't thank Shital enough from Shital's kitchen for this awesome recipe. 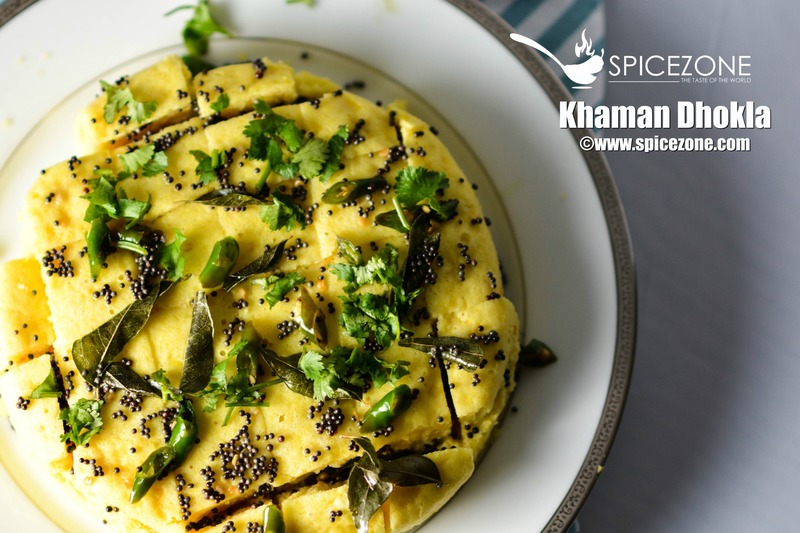 Have you tried Khaman Dhokla before? If not, then do give this recipe a try as I can guarantee you that you won't be disappointed. Do let me know what you think after giving it a try. In a mixing bowl, add besan, suji, sugar, citric acid & salt. Mix these dry ingredients and add 3/4 cup water. Using a whisk, mix it so that the citric acid granules dissolve. This should take approx 5-6 minutes. Also add the turmeric powder to the batter. The more you whisk the batter the better it is. It helps in the fluffiness of the dhokla. In the meanwhile, pour the water in the pot/pressure cooker (covered) you are using to steam the dhoklas with enough water at the bottom. The picture below shows the stand in the pot. Add ENO to the batter and then add 2 tbsp water on top of the ENO. This will make bubbles, mix it well using a ladle. Grease the container well. Add the batter to it and place it in the pot or pressure cooker and cover it. Let it steam for 20-25 minutes. Let it cool for 5 minutes uncovered. Cut into the desired shape. Then pour half a cup of water all over it. The water will be completed soaked. Transfer the cut pieces on to a serving plate. Now to make the tempering, add the oil in the frying pan. As soon as it heats up a little, add mustard seeds and let it crackle. Add the chopped green chilies and curry leaves. Let it fry for a couple of minutes. Add half of cup of water to the temper, watch for the splatter. Cover it if needed. Now add this temper to the dhokla with a help of the spoon. Enjoy it warm or room temperature with mint chutney and a cup of ginger tea. Mix these dry ingredients and add ¾ cup water. Using a whisk, mix it so that the citric acid granules dissolve. This should take approx 5-6 minutes. Also add the turmeric powder to the batter. The more you whisk the batter the better it is. It helps in the fluffiness of the dhokla. In the meanwhile, pour the water in the pot/pressure cooker (covered) you are using to steam the dhoklas with enough water at the bottom. The picture below shows the stand in the pot. Let it cool for 5 minutes uncovered. Cut into the desired shape. Then pour half a cup of water all over it. The water will be completed soaked. Transfer the cut pieces on to a serving plate. Punjabi Kadhi | How to make Punjabi Kadhi? 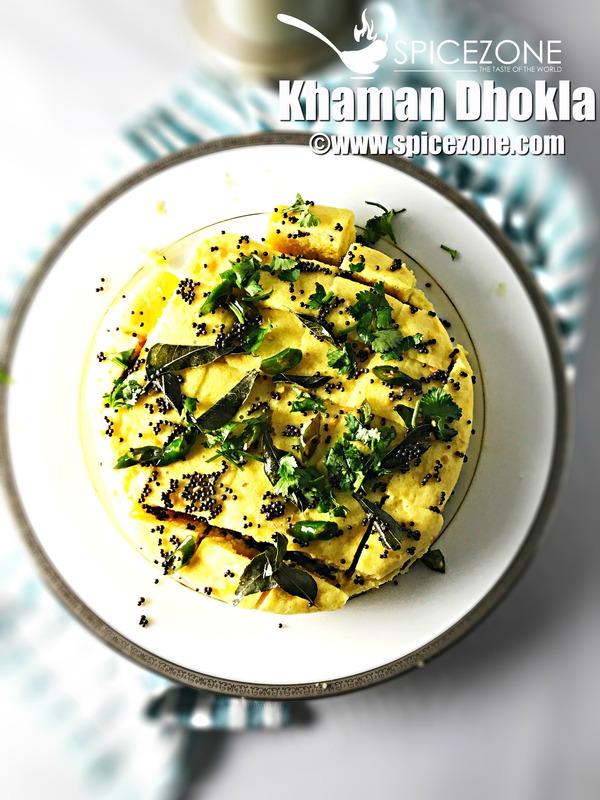 5 Responses to "Khaman Dhokla"
Yummy … my favourite !